Tiryakizade Kıraathane was opened under the Tiryakizade Süleyman Ağa Mosque, which presents features of Ottoman period architecture. 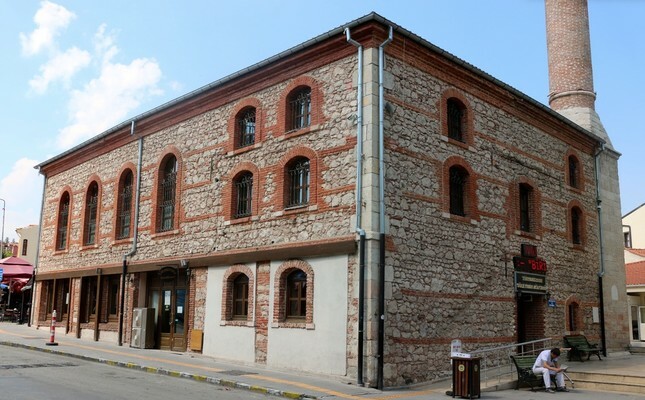 The Tiryakizade Kıraathane, a reading house with a coffee concept, which opened its doors under the Tiryakizade Süleyman Ağa Mosque in 2013 after restoration, offers a library of 5,000 books to all ages. Located in the historical Odunpazarı district of the city and built by Tiryakizade Süleyman Ağa in 1783, the mosque was restored under the supervision of the General Directorate of Foundations in 2013 within the scope of "permanent works" projects carried out by Eskişehir in 2013 with the Turkic World Cultural Capital Agency. Tiryakizade Kıraathane was opened under the mosque which presents features of Ottoman period architecture. Visitors can read books while sipping their favorite drinks and enjoying free Wi-Fi. President Recep Tayyip Erdoğan visited the kıraathane during his visit to Eskişehir on June 12. Turkic World Foundation Chairman and Justice and Development Party (AK Party) Eskişehir deputy Nabi Avcı stated that the Odunpazarı region, where Tiryakizade Kıraathane is located, is the oldest settlement area in the city. "It was in a desolate and abandoned state five to six years ago. When Eskişehir was declared the cultural capital of the Turkic World in 2013, many cultural and historical buildings were repaired, restored and opened to service again. It was restored by the Turkic World Foundation under the supervision of the General Directorate of Foundations. There is a mosque on the first floor and the ground floor serves as a kıraathane with thousands of books. The books appeal to people of all ages, with every taste and interest. There are periodicals. It has been serving as a kıraathane for five years to people of all ages from the retired to elementary school students," Avcı said. He also noted that while there was speculation over the word "kıraathane," which was included in the agenda after President Erdoğan announced the "national reading cafes," kıraathane has been used since the Ottoman Empire. Avcı further explained that "kıraat" means reading and kıraathane means reading house. These are places where people may enjoy coffee, tea, play chess and read newspapers. He further highlighted that this is an institution that existed before the announcement by the Turkish president. President Recep Tayyip Erdoğan during his visit to the kıraathane in Eskişehir, where visitors can read books while sipping their favorite drinks and enjoying free Wi-Fi. "It was opened as Tiryakizade Kıraathane. There is a library constantly expanding with continuous contributions and there are periodicals, tea and coffee. It is a place in demand. During his visit, President Erdoğan examined the books here and said, 'This is what we meant.' Kıraathane is an institution that already exists in our culture and the numbers will increase after the announcement by our president. This will be an example to the new reading cafes opened in different locations," he added. Avcı also announced that demolition on the old stadium in Eskişehir began and a public garden will take its place. The Turkic World Agency is building a new stadium where the old stadium, which is outdated, is located at and Avcı said that before they opened the land of the old stadium to settlement, they had promised a public garden and that two years ago a stadium for 35,000 people was opened to service. He also announced that the Housing Development Administration of Turkey and the governor's office signed an agreement for demolishing the structure and building a public garden as the Turkish president announced. "Public gardens are a part of our culture. They were used in the early years of the Republic and the late years of the Ottoman Empire. City parks were called as 'public gardens' in the past. Now, there will be public gardens in Eskişehir as well as in many other cities. This is a great development," Avcı noted. Avcı recalled that President Erdoğan announced Eskişehir will be the Turkic World Education Capital in 2019. Expressing that Eskişehir enjoyed being the Cultural Capital of the Turkic World in 2013, Avcı added that they have passed the law for a third university in Turkey, which resulted in the foundation of Eskişehir Technical University. "But more importantly, Eskişehir was also declared as the Education Capital of the Turkic World in 2019. So, what will happen in 2019? All schools and students from all levels of education, from primary school to universities will have brothers, sisters, friends or twins from the Turkic world. Eskişehir will have new and permanent educational institutions," he said. "One of the most important ones is Turkic World Education Technologies Research Center. We have crucial knowledge and experience in the field of education technologies. We will establish centers with the cooperation of Eskişehir Technical University as the Education Capital of the Turkic World with our experience. At the same time, we will implement various educational projects with Eskişehir Osmangazi University and Anadolu University," he added. Studying at Eskişehir Osmangazi University's Political Science and Public Administration Department, Serdar Büyükyol said he came from Adıyaman province for his university education. "There are no kıraathanes in Adıyaman. Turkey lacks such locations. It is very useful for Eskişehir to have such a kıraathane. I also benefit from this space frequently. There is a wide range of books here. You can read any book you like with tea and coffee. And there is also free internet. This is a location that should be everywhere," he said.